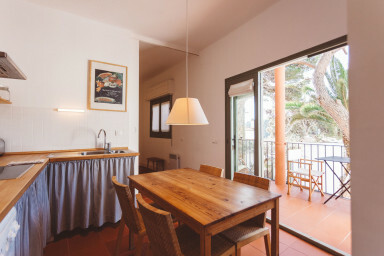 This is a recently reformed apartment of an old hostel in the beach of Tamariu. The beach is only 50 meters from the apartment. It is completely equipped. The apartment has a terrace for private use and a garden with tables and chairs to be shared with the other apartments of the building. The apartment has one bedroom with a queen sized bed and a sofa-bed suitable for two other people to sleep in. It is a very airy apartment as it has windows and doors in all areas of the apartment. The entrance to the old hostel is thourgh a door located on the first floor that leads you to an old stone stairway of 30 steps that take you right to the beach. You will find the beds covered with clean sheets. However, towels are not included under 4 nights. In case you need them you can request them before your arrival for a cost of 5€ each set. If you want to drive to Tamariu, you should know it is easy to find free parking spots on the same street most of the time, but if you happen not to find any, there is a parking place named La Pineda on the main street of Tamariu: La Riera, where you'll always find a spot to leave your car.Tamariu is 126 kilometers away from Barcelona and is one of the 3 beaches of Palafrugell along with Llafranc and Calella. It is very close to Begur and Pals as well, which are 10 and 20 minutres away respectively from Tamariu. Apartment close to beach but hidden away. Sometimes quiet, sometimes noisy depending who was in the other apartments. Bit hot at night (August). Beautiful area, great swimming and walking, and helpful owners. Hem estat molt agust. L’apartament súper net i ben decorat. La terraceta comunitària molt xul.la i tranquila i el propietari encantador. Ya es el tercer o cuarto año consecutivo que voy a estos pisos. Me gusta el ambiente tranquilo y relajado del edificio, la cercanía a la playa y a la vez la tranquilidad. El piso Tamariu 4 es muy cómodo, tiene una terraza muy grande con vistas al jardín y es amplio. Siempre duermo muy bien y descanso. Tot correcte, llevat que has de marxar a les 10:30 del matí. Si vols estar tot el diumenge a Tamariu, és un problema no poder disposar de l'apartament, ni tan sols per dutxar-te després d'anar a la platja.